As I write this, the first snowfall of the season is blanketing the city of Kamloops. I was standing by the window, experiencing the weather conditions at a distance. Fat flakes falling, spiraling around in the sky. The bitter wind blowing, vicious gusts disrupting the icy collective, hissings as they skit along the street and into the trees. Hello winter. I wasn’t expecting you so soon. Alas, too much of a good thing won’t do you any good either—and it certainly doesn’t benefit your health and wellbeing to shut out the outside world. A cozy homestead is positively delicious to come back to—but it’s best to venture out now and again to make the return all the sweeter. Gather a group. Book a babysitter. Lock that date down. Indulge in art, theatre and the thrill of creation. Participating creative projects and community events can do wonders for your health. Combat winter blues, depression and anxiety with thought-provoking and engaging spectacles, installations and productions. I’m not even making this up. Science has proven that creative expression reduces stress, increases positivity, boosts immunity, bolsters self-esteem, improves concentration, strengthens happiness. It’s like Vitamin C for the soul. Consume daily. Recommend to others. If your budget doesn’t allow for a widely varied of array of activities, volunteerism is a great way to access events and occasions. In addition, it’s a tremendous way to broaden your social network and make new friends. Above all, volunteerism offers the same positive components as art and culture. The Rex, 417 Seymour Street. Friday, November 10. 7p.m. - 11 p.m. The Timeraiser is part volunteer fair, part silent art auction and part social outing. “part silent art auction, part volunteer fair and part social outing. Meet with different agencies and match your skills to their needs. Once you have made your matches, you’ll be eligible to bid volunteer hours for on artwork. Arnica Artist-Run Centre. 7 Seymour St W.
A collection of mixed-media drawings, stop-motion animations and a sawdust tapestry characterizes a broad and interdisciplinary approach to drawing. Vancouver-based artist Osvaldo Ramirez Castillo generates personal mythic narratives that explore the contemporary social realities of collective memory, historical trauma and cultural identity. Runs until December 21. Please visit the website for more information. Barnhartvale Hall, 7390 Barnhartvale Road. Sunday, November 12. 10a.m.- 3 p.m.
Barnhartvale Community Association&apos;s is hosting it’s yearly showcase for local crafters and artisans—offers the ABC’s of a perfect Sunday: (arts, baked goods and crafts). Make macrame wall hangings with the talented Tana Jones. Pre-registration is required for this guaranteed to sell out events. The holiday version of Makeshift’s popular springtime Succulent Bar. Pick and choose your own fresh greenery and accents to create a wreath, swag, or holiday arrangement. Get a sneak peek at the handmade items prepared for the 2nd Annual Holiday Pop-Up Market happening on December 13. Get first dibs for one night only! Pre-registration is not required. Kamloops Pride has recently launched a free, all-ages community choir aimed at members and allies of the LGBTQ2S+ community. No experience is necessary and drop in’s are welcome. 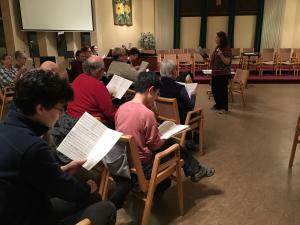 Sessions are led by director Rachel Casponi, music teacher and current director of the Kamloops Choristers. Broadway musicals, classic jazz and modern jams galore! Guaranteed good times. Kamloops Art Gallery, 101-465 Victoria St.
Every Tuesday at 3:00 p.m.
Seeking cups of tea, conversation and creative outlets? KAG School & Youth Programs Coordinator Anyssa Fortie will lead a workshop exploring a selected topic, ranging from pencil shading techniques to gouache painting methods. In addition to learning new art-making techniques, participants will also explore the work of contemporary and historical female artists. Contribute to a set of large-scale collaborative drawings, play Surrealist drawing games and enjoy some beautiful local beer. Experience not necessary. All supplies are complimentary. (Yes! More money for beer.) Minors are welcome with an accompanying parent or guardian. Enjoy a most colorful evening with a heavenly blend of artistic and alcoholic spirits. Hosted at various locations around the city, participants will be guided through an artist-led session to create a 16 x 20” acrylic masterpiece that you’ll be able to bring home. Supplies included in the entry fee. No previous painting experience required. Visit PaintNite.com to choose a place and time. Friday November 17 & Saturday November 18. 7:30 p.m. The Kamloops Symphony is teaming up with Jeans &apos;n Classics for a two-night celebration of chart-topping songs from the likes of Peter Gabriel, Electric Light Orchestra, David Bowie, Jethro Tull, and Moody Blues. The KSO will also be joined by local choir Serious Options, adding in extra vocal harmonies on several songs. BONUS: Student rates rock! Only $10.00 for students (under 19) and only $15 for TD Soundcheck Members (age 19-34). Go, go go, glow in the dark! What a way to support year-round community arts programming! The 3rd annual Kamloops Arts Council fundraiser offers an interactive arts and crafts for adults. Enjoy glow-in-the-dark activities. Get your body painted under black light. Make shapes on the dance floor as the DJ slings sweet tracks into the night. Bring cash for refreshments and silent auction. Academy of Dance. 910 Camosun Cresent. Sunday, November 19. 10:00 a.m. This six-hour workshop will introduce you to the world and history of Commedia. Warm-up with mask techniques, focus on Commedia stock characters, and combine all components through play and lazzi building. Susan Bertoia, a Vancouver-based theatre artist and Commedia dell&apos;Arte expert will facilitate. The workshop is open to ages 15 and older. Beginners welcome. November 30 – December 12. 7:30 p.m.
Get a head start of the holiday season with this Western Canada Theatre production. Adapted from the Charles Dickens classic by James MacDonald, this redemptive tale was specifically created for WCT audiences. This family friendly theatrical version is joyous, spooky, funny, and full of heart. Kamloops Art Gallery. 465 Victoria Street. Thursday, November 30. 10:30 a.m. Songs, stories, puppets and baby-friendly art making. …need we say more? No registration required. All supplies provided. Class meant children three and under-but older siblings are welcome. Alicia Ashcroft is a freelance writer and performer. She is also the Writer and Storyteller for TRU's Faculty of Student Development and can be heard as an on-location personality for B-100 and CIFM.